We are proud to be associated with innovative and leading MFIs—operating in 30 countries around the globe—who are helping to combat poverty by providing the poor with access to basic financial services. And we are proud that our state-of-the-art Kredits technology is helping each of these MFIs build their operation and grow their profits. Business Operating Challenges: When first approached, this institution was already very well organized from a business process and work flow perspective. All client-related information was diligently and meticulously collected on paper by the loan officers and branches and then subsequently keyed into summary spreadsheets at the head office. However, this manual process created significant operational inefficiencies, was the principal cause of any loss of data integrity, and most importantly severely constrained their ability to grow their efforts towards their clients on an efficient, scalable and sustainable basis. Results: Following the successful implementation of the Kredits technology and business process engineering solutions, the MFI was able to reduce their overall client service-related operations from 24 man hours to 2 man hours. This in turn released valuable resource capacity to focus on their efforts to grow their outreach and level of products & services to their clients. 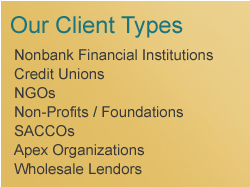 Prior to adopting the Kredits solutions, the MFI was servicing 20,000 clients across 12 branches. Today, some 5 years later, the MFI has successfully accelerated their business growth and service over 250,000 clients across 100 branches using the same technology solutions. Operational challenges: Loan disbursements were made using manually prepared checks which required considerable amount of time, resource and expense. This manual, paper-based process also resulted in frequent errors resulting in increased cost of operations. In addition, the MFI’s bank statements did not provide sufficient detail to help identify the clients who had received their disbursements or made repayments and which checks had or had not cleared. a completion time of 5 weeks. Results: As a result of adopting the Kredits solutions, the MFI was able to greatly simplify its product terms and realize increased process efficiencies and accuracy throughout the lending process. The new, automated check-production facilities resulted in more timely and accurate reconciliation, as well as accounting reports. The time taken for the collection process was significantly reduced, enabling loan officers to quickly and easily determine which clients disbursements and repayments were scheduled for any given day. In addition, the accuracy of collection information increased dramatically, resulting in more rapid processing of information using the Kredits technology. Our MFI partner has since been able to increase their outreach and provide their financial services to over 23,000 active clients. At Kredits, we know that, first and foremost, we are in the client service business. It's why our clients know that we are always available to support them - anywhere, anytime.